COST Commentary: This is a COST article addressing six major reasons Austin citizens should reject Austin’s Light (urban) rail to appear as Proposition 1 on November’s ballot. The frequent reporting of surprises and bad news regarding light rail (increasing costs, huge tax increases and it creation of growing congestion) to serve low ridership, and the fact that many key rail questions proposed by the Mayor and others, as prequisites to approval, are still unanswered after more than three years, make it irresponsible that the City approved light rail Proposition 1 to be placed on the ballot. These 6 reasons to reject light rail are supplemented by COST’s recent posting of an article by Bill Oakey, “Why You Should Vote Against The Rail Bonds On Nov. 4th” which outlines the major tax impacts of this rail to Austin citizens, 99% plus who will never ride it and reap zero benefits from it while continuing to be stuck in growing congestion due to the wasteful spending of more than $2 billion tax dollars (real cost estimate with interest on bonds) and $36 million (real cost estimate with interest on Cap Metro debt) in annual operations for this rail. These 6 major reasons are supported by the COST posting of “Project Connect’s Proposed Austin Urban Rail is Misguided” and several other articles posted on COST’s site. Note: This posting is a rewrite of the previous “12 Reasons Austin’s Urban Rail is Off-Track” which has been updated and is still valid with slight updates needed. It covers a few more reasons to reject urban rail. 1. Transit Ridership has been small and stagnant in Austin and major Texas cities for the past 15 years and in the overall U.S. for 57 years. 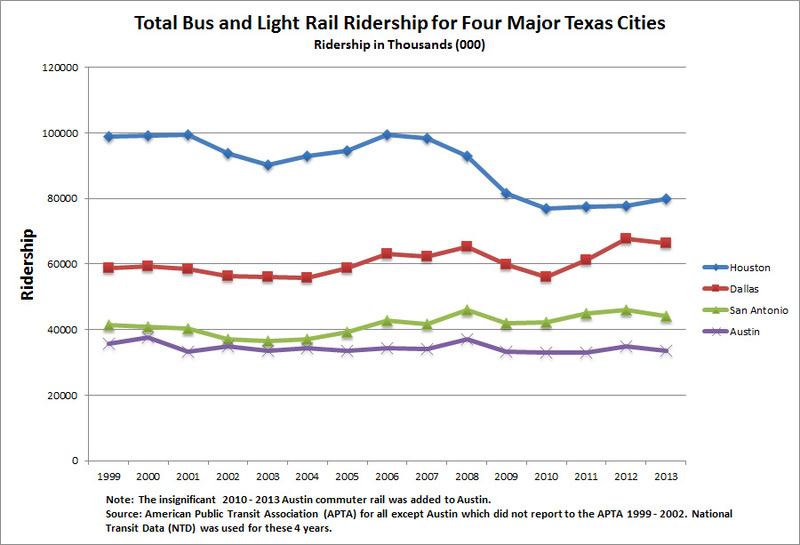 The 15 year transit ridership trends for the four largest Texas Regions are shown on the first chart below. The trends can be best described as stagnant. The sum of the four cities indicates a slight ridership loss over the past 15 years. These are four of the top 15 fastest growing regions (greater than I million population) in the nation. Thus, the percentage of people riding transit has continued to drop much more dramatically. The Cities’ population growths are shown in the second and third charts below. Dallas and Houston are in the second chart, separated from San Antonio and Austin in the third chart because of the major population differences and chart readability. While these four Texas regions have spent billions of dollars (greatest portion on trains) to encourage and grow public transit ridership, people’s choices have primarily rejected transit in favor of private and more flexible transportation which is faster and more convenient; in many cases serving trip origins and destinations and reaching opportunities which cannot be accessed by transit. Meanwhile, taxpayer subsidies for public transit have substantially increased: Transit costs have grown much faster than inflation; as the rail portion of transit has increased. This rail increase has not changed the ridership stagnation. Total transit (bus and rail) is small and “stagnant” with decreasing percentages and actual ridership due to citizens’ choices for a better quality-of-life. 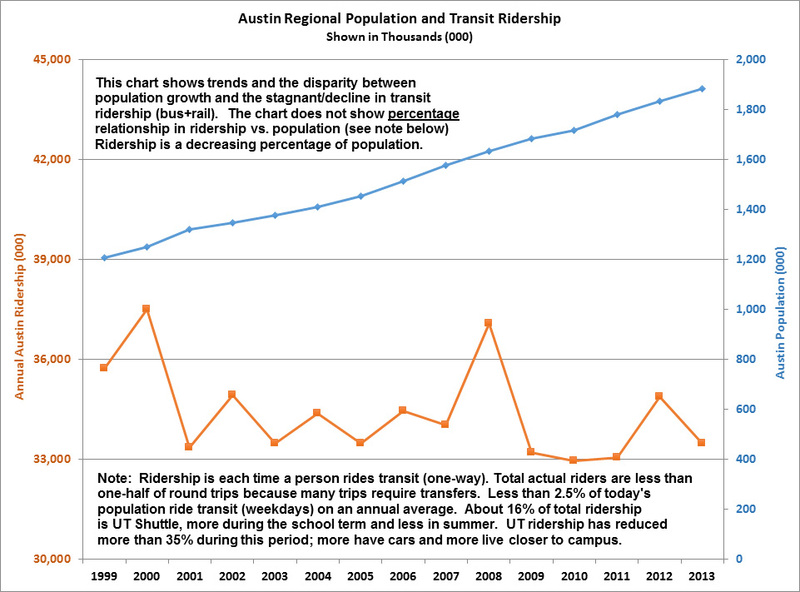 This is demonstrated by the disparity in ridership and population trends for the Austin region shown in the last chart below. The chart compares the Austin region’s population growth trend to its stagnant/declining public transit ridership trend over the past 15 years. This results in a significant decline in the percentage of people using public transit. Adding ‘transit costs per rider’ would also show an increasing trend and well above inflation; resulting in large and increasing taxpayer subsidies for each transit rider. Cap Metro reports operating costs (excluding capital costs) for each average commuter train rider are $20.00, or 5 times the cost of each average bus rider. 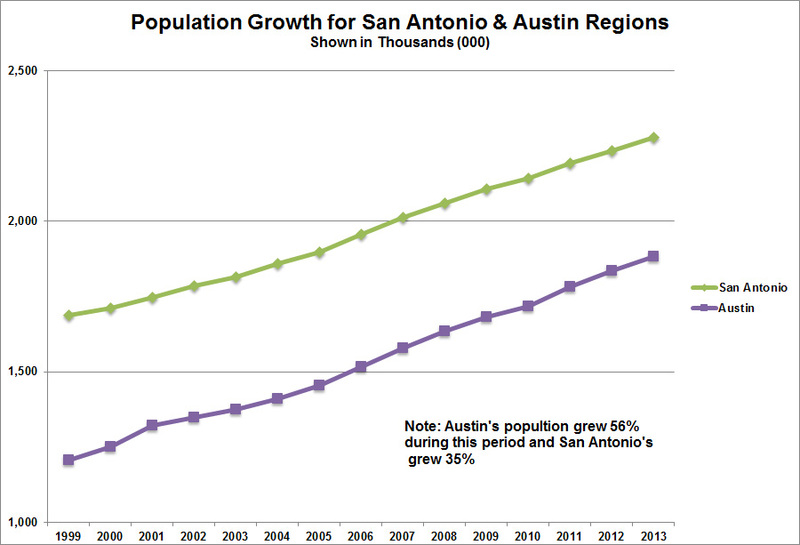 Visualize this chart if population trends continue for the next 15 years as Austin’s regional population is projected to do. Population would increase by more than 1,000,000 to about 2,900,000. There are no experiences or trends in the U.S indicating transit’s ridership trends will change very much. 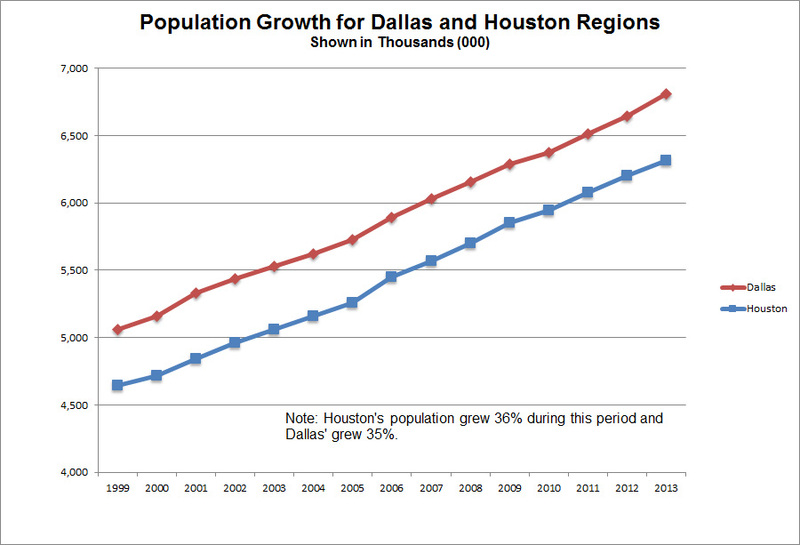 This population/ridership graph alone should reject the concept of light rail in Austin. This proposed insignificant train route and ridership can do nothing to improve congestion but will increase taxes for all, resulting in major lost opportunities to better serve Austin citizens. Austin and regional leaders should support citizens’ free choices and not base mobility solutions on the need to change citizens’ behaviors which have been determined with careful consideration of their choices to better meet their needs. Constraining people to the reaches of public transit substantially reduces opportunity and degrades quality-of-life for most. 2. Austin’s planned urban rail will not reduce congestion. Public transit has small ridership with many riders who do not have private vehicle alternatives, resulting in little impact on congestion. More subsidized rail transit riders would cause increasing total taxpayer subsidies, resulting in increased fares which fewer low income riders could afford. A more important factor is that potential urban rail riders on East Riverside Drive are not the car drivers creating congestion on the highways into central Austin. These few East Riverside drivers would be on surface streets for the short, 4 mile distance to city center. This is also true of train riders from the Highland Mall area, about the same distance. Urban rail provides no measurable improvement for Austin’s major congested roads. Project Connect’s projected rail ridership is inflated but would be only a small fraction of transit ridership and less than one-quarter of 1% of total passenger miles, even by the optimistic 2030 estimate of 18,000 boardings. This is only 9,000 people on a round trip out of almost 3 million people in the region, making more than 8 million trips per day, in 2030. Project Connect estimates only 6,500 of these 18,000 trips were new to transit. The other 11,500 were previous bus riders. This makes the train even less responsible and cost-effective as $1.4 billion is being spent to serve an estimated 6,500 new transit trips (3,250 people making round trips) in 2030. This is $ 431,000 for each new, daily, round-trip rider; not counting operating costs or the almost certain major cost overruns. The proposed “urban rail” will create far more congestion than any minuscule positive impact it might have in a limited situation and area. By 2030, the region’s population growth will have resulted in an increase to about 8 million road trips per day. The trains and infrastructure to support these new 6,500 transit, rail trips per day will cause major added congestion in its relatively small area of the city and will result in increased congestion throughout the region as it siphons a large portion of finite transportation funds from more effective transportation projects. It is great the mayor balked, along with many of us, at the idea of removing a lane, each direction, from East Riverside drive to provide two train tracks. This and the proposed closing of Pleasant Valley Rd. through the East Riverside Dr. intersection will result in a major increase in congestion. East Riverside Dr. has 40,000 to 55,000 vehicles per day and one can be sure a minor percentage are headed downtown; so the rail cannot be expected to replace many of these road trips and will replace almost none on I-35. This is just one situation, of many, indicating the proposed urban rail is not ready for an election. In addition to the added East Riverside Dr. congestion, the rail will remove potential car lanes from roadways along its entire, but short, route of 9.5 miles; increasing roadway congestion and safety hazards. The urban rail route is also parallel to, and about 4 blocks west of I-35 as it passes through UT and along the East edge of Austin’s city center. This stretch carries a major portion of the vehicles from north and south I-35, and other points east, into the downtown/UT area. Therefore, all these vehicles entering and exiting central Austin and UT must cross the rail tracks and be potentially delayed by “frequent” trains (about every 5 minutes at crossings as trains run on 10 minute intervals, north and south). This will cause a huge increase in Downtown area congestion. There are many far better ways to serve transportation. In addition, riders are making one-way trips which average less than 4.5 miles, which means the difference between the train trip time and a modern bus time is very short and exorbitantly expensive for taxpayers to pay for this very short, if any, saved time. 3. More than 99% of all regional passenger miles (private, shared, public transit, commercial, school, emergency and government) are on roads and the primary way to improve congestion is improved roadways. The Mayor is reported to have said Austin’s traffic congestion “calls for a big solution.” He states it needs trains, as well as roads. The City funding plan and bond amount has changed frequently. Austin’s current Proposition 1 rail plan is based on “smoke and mirrors” manipulation and maneuvering. The cities contemplated $1.4 billion train will be paid for with a $600 million, Proposition 1 which is somewhat conditioned on receiving $600 million from the federal government (or other grantors) and on committing $400 million to their so-called road projects. It is not known how the city plans to get the additional $200 million which this plan falls short of the $1.4 billion currently estimated for this 9.5 mile light rail. The condition based on receiving $600 million from the Federal Government (or others unknown) also has a “gaping hole” in that the City can spend an unlimited amount on planning and engineering prior to recieving any matching funds. This poses a major risk that hundreds of millions of tax dollars could be wasted if a Federal grant is not received and it will take 3 or more years to find out. $1.4 billion currently estimated for the 9.5 mile rail. Another poorly constructed “political” factor in this maneuvering is that the “Chamber of Commerce and Real Estate Council of Austin exerted pressure for the City to have 40% of the bond election dedicated to roads. Therefore, the city arrived at $600 million for the rail and $400 million for roads. Even this is muddy in that more than a third of the $400 million of the road money is to support current and future rail construction, with zero impact on congestion. Other large portions are for I-35 overpasses, having little congestion impact in supporting future, undefined timing, lane additions to I-35 South by TxDoT. The third portion, smallest but most highlighted, is for studies of several roadways for potential future (unknown time) upgrades. There is not a single mile of major congested roadway upgrade in the $400 million package. The initial City plan to place $600 million for rail bonds and $400 million for “road” bonds on the same referendum was rejected by the State Attorney General as not legal. This sham was to blackmail those believing roads are needed to vote for the rail bonds in order to get the roads. This has been used in a few cities where rail could not pass on its own merits. This combining of road financing and rail bonds in one referendum is the most egregious act of all the City’s dishonest manipulations. This is a blatant disregard of the voters’ rights to make independent decisions on these two very different issues. Ninety-nine percent of trips are on the roads and investment of these dollars in roads improves the travel for more than 25 times the number of people which are served by this train. Combining them is clearly a feeble attempt by the City Council to improve the probability for approving the rail. Even here, the City was deceptive in that the $400 million for “roads” was more focused on train needs than on congestion relief. This City funding plan is very high risk to tax payers as it is highly unlikely due to the projected near term depletion of the ‘federal highway trust fund’ (federal gas tax paid by users) and the burden of huge federal budget deficits. On a much smaller scale, this is similar to Cap Metro promising voters in 2004 that the U.S. government would pay for one-half the planned commuter line. The U.S. paid nothing and Cap Metro knew, or was incompetent in not knowing, the commuter did not qualify for federal funding. Austin prides itself in being a city of innovation and ‘above the rest.’ Yet, in addressing congestion, it is pursuing outdated 19 century rail technology and mimicking failed approaches of various cities which have pursued this path before. Where is the Austin innovation? There are numerous ways to improve congestion and there are more creative ways to be discovered. A) The first step to control congestion is to maintain a road system consistent with the growing population. In Austin, one still cannot take a complete vehicle loop around the city without stopping. A number of road projects are in progress but the City is well behind from years of road neglect based on a leadership philosophy of: if we don’t build it, they will not come. This and significantly reduced road funding are being somewhat compensated for by toll road segments and lanes which are increasing capacity primarily paid for with user fees which provide congestion relief for many major roadway users, both for tolled and tax paid (non-tolled) roads. For example: For example: The first segment of the 183A toll road opened in 2007 and was completed in 2011. The Manor Expressway toll upgrade of SH-290 was completed and opened in May, 2014. The MoPac Expressway upgrade is planned to open in the fall of 2015. These upgraded roads serve hundreds of thousands of citizens daily; traveling to and from the east and northwest of Austin as well as a north-south road in Austin’s center which serves citizens heading into central Austin or those heading farther south and those going north connecting to the 1 toll road and other northern destinations. The total of these three corridors is about 350,000 vehicles today and, at 1.5 passengers per vehicle, this is about 525,000 people trips per weekday. (There may be a small amount of double-counting as some people may travel on more than one of these corridors for a single, longer trip.) The total costs are roughly $1.1 billion (today’s dollars) for the three roads which is about the same cost as the proposed urban rail in today’s dollars. This does not consider the significant costs of congestion caused by urban rail including taking away road vehicle lanes and potential delays to all vehicles, crossing the tracks as they enter and exit Austin and UT on the east side of downtown and the campus. The total road length of these three roads is more than 3 times the urban rail length and total new road lane miles of more than 113 or about 6 times the 19 rail miles of two 9.5 mile rails. The total trips on these roads will be more than 100 times the City’s projection of this rail’s trips in 2030. Mobility is greatly enhanced by these upgraded roads with total traveler trips of more than 550,000 per day by the end of next year: private, shared, public transit, commercial service and product, emergency and other government. This is 85 times the 6,500 new transit trips served by the urban rail estimate for 2030 or 30 times the estimate of total daily rail ridership of 18,000. The current road improvements are structured for future demand and will serve some 40% more vehicle trips per day, for total passenger trips of about 740,000, by 2030. The average rail rider (2/3 previously rode buses) will ride about 4 miles and save very little time, if any, compared with bus alternatives which cost less than one-tenth the rail. With 8 million daily trips in the region in 2030, this rail will serve 0.2% of the trips and .08% of trips will be new to transit. In addition the road vehicle trips will save significant travel time while the urban rail will significantly congest traffic and increase the total region’s travel delay time. B) Staggering work shifts and providing flexible work hours for major employers can have a significant reduction in peak hour traffic. C) Austin is high in carpool commuting percentage, almost 5 times the use of public transit without the support of HOV/Managed-toll lanes, rare in a city this size. A number of managed (toll) lane projects are in process or planned which can enhance carpool riders as well as relieve congestion and speed private, public transit, emergency, government and commercial service and product vehicles. This is achieved by users choosing these lanes and paying for them; resulting in greater mobility for all road users, both toll roads and non-tolled roads (those paid for by taxes, gas and local). D) Austin Metro’s ‘Work-at-home’ is the fastest growing commute mode, is the most cost-effective mode and is enhanced by technology advances. Work-at-Home is almost 3 times transit’s 2.3% work commute mode and takes more than three times as many peak hour drivers off roads than public transit because many more have vehicle alternatives than transit riders. E. Public transit use for work commuting is the 5th highest mode and less than the modes of: single drivers, car poolers, home workers and the total of all others (bikes, walking, etc.). Trains do not necessarily increase transit work commuting. Dallas has spent billions to implement the longest, 90 mile, light rail system in the nation but their percentage of transit work commuters is only 1.5%, 50% less than Austin or San Antonio at 2.3%; neither with light rail. Yet, public transit serves a vital, primary community function to provide mobility for those who have no alternative. To maximize this primary objective, public transit must be cost-effective or it is not sustainable. If not cost-effective, fewer of people’s desired trip origins and destination can be served and fares will be higher. Public transit must be better connected to today’s needs. The city center ‘hub and spoke’ orientation and focus are outdated as the average large city Central Business District (CBD) today has fewer than 10% of the metropolitan statistical area (MSA) work force and it is declining. Austin currently has about 8.6% of the regions workforce in the CBD, but rises to about 14% counting employment just outside the CBD which includes UT and State government workforces. Transit fleets with rubber-tire, flexible, different size vehicles must be implemented and efficiently managed to provide cost-effective transit which is timely and serving expanded origins and destinations. One example concept: ‘Cellular Mass Transit’ with rubber tires deserves objective evaluation. Some cities are authorizing various forms of small vehicle paid transportation, generally individuals or small companies (jitneys is an example); in addition to public transit and taxis. Double deck buses can provide cost-effective transit in high transit corridors. These buses can match the capacity of light rail systems for a fraction of the costs. F. The innovative list to improve overall mobility includes numerous car sharing concepts and approaches: Examples are car and bicycle rental/sharing companies; shared vehicle companies such as Uber, Lyft and Carma, controlled by phone apps; and, for profit Jitneys (private vans/buses) serving some transportation segments. G. Implementing such road system enhancements as ramp metering, smart traffic lights and other modern traffic technologies. H. Implementing efficient incident management on congested highways. 4. Urban rail will not produce new developments which provide increased property taxes. Rail will result in higher property taxes for all taxpayers, few of which receive any benefit. Rail will not produce new jobs other than for its construction/implementation and operations which are almost all paid for by taxpayers. There is an economic loss with rail as higher taxes reduce the economy by removing citizens’ discretionary funds from the economy. Perhaps the most important losses are opportunity losses to spend wasted rail funds on more productive mobility and for other purposes which enhance the quality of life of all citizens and lower citizen’s taxes. Numerous studies and experiences in other cities confirm this item. Portland planned major development increases near light rail stations and, after many years of little development, major tax and other incentives were provided to developers to motivate construction. The general fund suffered from loss of tax revenues, resulting in higher taxes for citizens or reduced funding for such city services as police, fire and emergency. Here in Austin, developments near the commuter rail were projected, but none have developed due to the rail. Recently, Leander significantly reduced the area around its rail station which had been zoned for higher density development because almost nothing has developed. The bottom line is: People do not come to cities because of light rail, but for opportunity. Rail can, possibly, have some impact on the location of development but it is not an increase to the area. Austin is the fastest growing region in the Nation and none of it is due to rail. 5. This urban rail recommendation has not been established by responsible alternatives analyses: starting with definition of the problems to be solved and objectively evaluating the most cost-effective alternatives to address them. Every “official” group, citizens committees, Capital Metro, or Austin city organizations, which have evaluated the need for a possible Austin light (urban) rail during the past 25 years has recommended a different route. Even the current route was recently changed before final approval. Consider the significance of this. Fixed, inflexible rail is not the answer for a young, growing city with changing development patterns. Flexible, cost-effective rubber tire systems should be used, at least, until ridership and cost-effectiveness is established. Rail is very expensive to move and if you discontinue it, you must pay back any federal government’s matching dollars. Thorough “alternatives analysis” and cost-effectiveness has not been used to establish rail recommendations and has not been presented to decision makers as a basis of selecting the current urban rail mode or the selected route. At this late date, few of the key questions published three year ago, by the mayor and others, have been responsibly addressed and presented by the Project Connect group which has created this urban rail mode and route. The City’s advertised story that citizens have been key contributors to this rail recommendation is completely without foundation. Light rail has been deftly guided by a handful of Austin’s government, political and business leaders projecting a pretense of openness and transparency. Instead, concealment has prevailed. 6. As demonstrated many times in numerous cities, this approach of implementing ineffective, high cost rail for few riders will significantly reduce citizens’ quality-of-life and degrade social equity by increasing taxes for all while reducing overall transit services and increasing fares, disproportionately impacting low income citizens. The community will be robbed of massive “opportunity” funds for more important uses, including lower taxes. The biggest “bang for the buck” in mobility is to make maximum utilization of expensive infrastructure. The lack of concentration and the spread configuration of today’s origins and destinations allows only roads to reach the maximum percentage in acceptable times and affordable costs. Needed public transit can use these roads, with flexible, rubber tire vehicles, without the added, massive cost of fixed guidways for bus or rail infrastructure which degrades overall mobility. This would significantly increase the reach of public transit to provide greater opportunities and quality-of-life for those without transportation alternatives. All public transit is highly subsidized. Transit must be cost-effective to be sustainable and to provide transit for the most citizens to reach the broadest range of trip origins and destinations. The City’s Proposition 1, on the November Ballot (near the end of the ballot), proposes $600 million for rail bonds and $400 million for road debt. This belies the fact: 99 plus % of the region’s daily passenger miles are on roads. Therefore, the 9.5 miles of urban rail, would receive $1.4 billion from the combination of local taxes, tax supported bonds and “hoped for” U.S. Government grants. This is a total of almost $2 billion dollars and almost none of it improves major congestion areas as a major portion of the road funds are for the rail, some overpasses and studies – very little road pavement. This rail will not improve congestion, but will increase it! It is not economically feasible to build enough trains, carrying enough people, to enough places, to have any measurable, positive impact on congestion. Congestion can only be significantly improved with roads, tuned and supported by modern roadway management approaches. The City is playing down the fact they call this urban rail the “initial investment” and have vaguely mentioned this initial rail must be expanded to “really make it work.” The expansions have been expressed on charts as numerous wide brush-stroke bands emanating across the region from the current trains route area. And there has never been a discussion of how many billions of dollars and time this will take. Certainly there has been no reference to the required major tax increases which would overlay the initial rail’s tax increase. This joint referendum (City Proposition 1) is a deceitful, manipulative distortion showing disdain for voters and responsible process. It is designed to attract and “buy” votes of those desiring roads; votes for a rail they would otherwise reject. Roads and rail should be separate referendums so voters can decide tax allocation priorities. Rail is very low on any responsible list of priorities. ALL VOTERS SHOULD REJECT BLACKMAIL: VOTE AGAINST THE JOINT ROAD-RAIL PROPOSITION 1. Charts below can be enlarged by clicking on them and use ‘back’ arrow to return to article. Click to enlarge and use ‘back’ arrow to return to article. This entry was posted on Monday, September 1st, 2014 at 11:00 am	and is filed under News Articles. You can follow any responses to this entry through the RSS 2.0 feed. Responses are currently closed, but you can trackback from your own site.